The company had announced this product of their in the month of February 2016. Just after the announcement, it attracted every single person who heard about it. Following the rush, the company got registrations of over 70 million people. However, when the product came out in media, it just had the logo, and the product was manufactured by some other company. That cause a lot of nuisance and public protests in tremendous numbers. Buyers got disappointed. Thus, it followed a probe by the police and tax authorities which forced the company to put a full stop on its sale and asked to offer refunds. Freedom 251 specifications include a quad-core processor, features a 4-inch touchscreen and sports back and front cameras at just an amazing price tag of Rs. 125 INR only. Ringing Bells director Mohit Goel told that the first phase of shipping would start on Friday, and the first batch will include as many as 200,000 units. The buyers have been selected through a lottery. Recently, the same organization has unveiled seven new low budget smartphones and an LED TV at just Rs. 9,990. The director himself told the reporters during a press conference. Earlier, the deliveries had to begin from June 30, but the Freedom 251 delivery date got postponed. Last month, the firm had announced to give 10,000 phones to customers in 19 states, but the figure has come down to 5,000. The director told that the first batch of 5000 devices would be released for delivery from July 8. The customers will have to pay Rs. 40 as the delivery charges. So, the total cost comes up to Rs. 291. Goel had earlier stated that they had imported the parts from Taiwan, and each phone has cost them about Rs. 1,180. By giving the same product to customers at Rs. 251, they get a loss of Rs. 930 on each phone. Further, he stated that Rs. 700-800 will be recovered easily from app developers and advertisement revenue. Just after the announcement, about 30,000 people paid for it in advance in February itself. And a total number of 7 crore people registered for it. The figure is equivalent to the combined sale of Samsung and Apple in an entire year. Now, the company is ready to ship 2 lakh units of Freedom 251 at Rs. 251 if its gets the help required from the government. Getting approval from the government will take time, but it will still ship 2 lakh devices to the people who had registered for it. Moreover, the company also launched four new feature phones in the range of 699 to 999 INR and two budget Android smartphones ‘thatare’ which will cost 3,999 to 4,499 INR. In addition to it, the firm also unveiled three power banks, and a 31.5 inch HD LED TV priced at Rs. 9,900 only. It will be launched on August 13. Another Scam in Freedom 251? 48 hours gone and no mail sent by the company ! 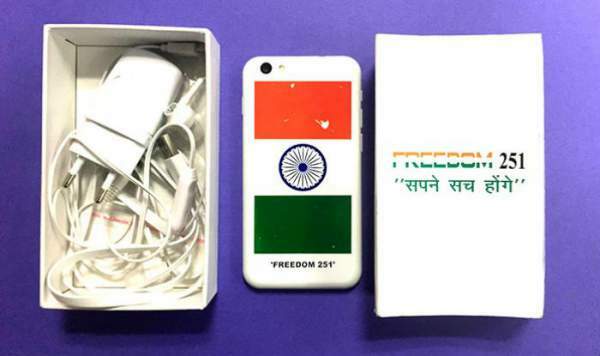 I did not receive the freedom251 smartphone and it’s very sad for me that I will not receive it in the coming days too. When I got it . I also booked that time. Please give me early as possible.